The East Empire Dockmaster is an Imperial citizen found in the East Empire Company Warehouse. He loiters around the warehouse all the time, eating and sleeping at random times. 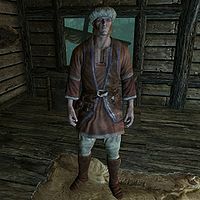 He wears a set of merchant clothes, along with some boots and a hat. He carries an iron dagger. The Dockmaster will simply greet you with, "Good day to you." or "Do you have business with the East Empire Company?" However, he may also brush you off with, "I will thank you not to interrupt me in my tasks." or assume you're looking for work, "Sorry, I have everyone I need at the warehouse. Times are tight." An unused alias in game data (0003B81F) suggests he was going to be named Regulus Naevius. This page was last modified on 3 April 2014, at 23:53.